That glorious and pure their country be. Who rest in peace to all eternity. Son of Mr & Mrs RB Pringle of Ardmore, Guildford, Surrey. Went from the OPS via St Cuthbert’s, Malvern to Winchester. Entered Army in 1911. Died of his wounds in the battle of the Aisne, aged 28. Son of Mr & Mrs JE Campbell of Rawlinson Road, Oxford. Scholarship to Clifton College (1908) and won Senior Mathematical Scholarship at Hertford College, Oxford (1912). Killed by shellfire at Ypres, aged 20. Son of Mr & Mrs CRL Fletcher of Norham End, Oxford. Scholarship to Eton (1905). Balliol College, Oxford (1910). Killed by shellfire at Ypres, aged 22. Son of Col & Mrs Leggett of Hythe, Kent. Tonbridge (1907) and Sandhurst (1911). Killed by shellfire, whilst asleep in his trench near Armentieres, aged 21. Arthur Percival (Lieut-Col., Northumberland Fusiliers). Son of Dr & Mrs John Percival. Marlborough & Rugby Schools. Sandhurst (1889). Killed by shellfire at Hooge Château (Ypres), aged 43. Son of the late Mr & Mrs Haigh. Exhibition to Winchester. Corpus Christi College, Oxford (1907). University nominated Commission (1911). Shot in a charge on Hill 60 (Ypres), aged 26. George Fletcher (2nd Lieut., Royal Welch Fusiliers). Son of Mr & Mrs CRL Fletcher of Norham End, Oxford. Scholarship to Eton (1900). Balliol College, Oxford (1907). Subsequently taught at Schleswig Gymnasium (1910-11), Shrewsbury School (1911-13) and Eton College (1913-14). Shot by a sniper in the trenches near Bois Grenier, aged 27. Ronald Poulton Palmer (Lieut., Royal Berkshire R). Son of Professor & Mrs EB Poulton of Wykeham House, Banbury Rd., Oxford. Entered Rugby (1903). Exhibition at Balliol College, Oxford (1907). England Rugby International (1909-14) and captain (1913-14). Shot by random night-time rifle fire at Ploegstreert trenches, nr. Ypres, aged 25. Basil Parker (Capt., Hampshire R). Son of Mr & Mrs G Parker of Pinecliff Avenue, West Southbourne in Sussex. Educated at Bedford Grammar School before joining the Army (1889). Shot in a charge on enemy trenches near Krithia, Gallipoli, aged 37. Son of Dr & Mrs Chapman of Beachwood, Hereford. Went on to Clifton College before studying Music. Died in Malta of wounds suffered in Gallipoli, aged 21. Son of Mr & Mrs Eastwood of Hoylake, Cheshire. Educated at King William’s College, Isle of Man & Worcester College Oxford. From 1907-14 he was a master at the OPS. Served in Gallipoli, where he was wounded. Died of dysentery in Alexandria, aged 29. Son of Mr & Mrs GF Higginson of Tenbury, Worcestershire. Educated at Ludlow Grammar School, winning an exhibition to Balliol College Oxford. He joined the staff of the OPS in 1911. Killed in an accident near Laventie, when his dug-out caved in, aged 26. Only son of Mr & Mrs JB Rawlinson of Graythwaite Old Hall, North Lancs and 35 Park Lane, London. After leaving Blundells, he was training as a chartered accountant when broke out. Killed in an attack on the opening day of the Battle of Loos, aged 21. Only son of Professor & Mrs Macdonell of Chadlington Road, Oxford. He was elected to a scholarship at Repton and then went up to Balliol College, Oxford. At the start of the war he joined the Ox & Bucks Light Infantry before going to Sandhurst and then obtained a commission in the 1st Cameron Highlanders. Killed leading a bombing party at Hulluch in the battle at Loos, aged 21. The eldest son of the Rev & Mrs WG Whittingham of Glaston Rectory, Uppingham. He won an exhibition to Felsted School and joined the Leicestershire Territorials in 1913. Killed leading an attack on the Hohenzollern Redoubt in the battle at Loos, aged 22. The son of the late Dr. Arthur Venis, Raymond went on to Repton School and the Royal Military College at Sandhurst. Served briefly in the South Staffs Regiment and joined the IARO in 1914. Died of his wounds in the battle of Ctesiphon in the Mesopotamian campaign, aged 28. The eldest son of Commander & Mrs Tyrwhitt of St Leonard’s-on-sea in Sussex. He served in the South African War, receiving the medal with three clasps. Fought at the battle at Hooge, for which he was Mentioned in Despatches. Killed by shellfire at Ypres, aged 44. The elder son of Mr & Mrs John Mason French of Boscombe. He won a scholarship to Blundell’s School and joined the army soon after leaving school in 1911. Died of an infection, following wounds suffered on the first day of the battle at Loos, aged 22. Son of Mr & Mrs Falconer Madan of 94 Banbury Road, Oxford. After only a year at the OPS, he spent time at St. Cuthbert’s in Malvern before returning to Summer Fields, Oxford. Won a King’s scholarship to Eton and a Classical scholarship to Christ Church, Oxford. He worked briefly for a shipping firm before joining up at the start of the war. Killed in an attack on the Bluff at Ypres, aged 27. Son of the late Lieut-Col LF Childe and Mrs Childe of 7 Chadlington Road, Oxford. He won the 2nd Scholarship to Clifton College. He was reading Medicine at Pembroke College Cambridge when war broke out. He joined the Glosters and was in charge of a Lewis Gun Detachment. Killed by a stray bullet at Merville, aged 21. Second son of Mr & Mrs Horace Robinson of Kaima Betta, South Coorg in India. Although he was born in Bournemouth, he spent most of his life in India. Joined the Indian Army Reserve in 1914 and was attached to the Mahratta Light Infantry. Died of wounds received near Kut, aged 22. The only surviving son of Professor William Esson & the late Mrs Esson of 13 Bradmore Road, Oxford. From Rugby William joined the Royal Naval College, Greenwich in 1893. Killed when his ship, HMS Russell struck a mine, aged 42. The younger son of Major & Mrs Herbert Freyberg of 8 Grays Inn Square in London. Lance joined the Navy Class at Marlborough before getting his Cadetship in HMS Britannia in 1901. He served in the Channel Squadron and Mediterranean Fleet on the battleships Mars, Caesar, Duncan and Vengeance. Killed when his ship, HMS Russell struck a mine, aged 31. Son of the late Mr Frederic Drew & Mrs Drew of 19 Ferndon Road, Oxford. Won a Classical Scholarship to Rossall School before studying at Pembroke College, Oxford. He returned from the Bombay Burmah Trading Corporation to join the 22nd (Kensington) Battalion. Killed in action near the Vimy Ridge, aged 32. Son of the late Mr Herbert and Mrs Fisher. Won the top scholarship to Westminster School (1889). 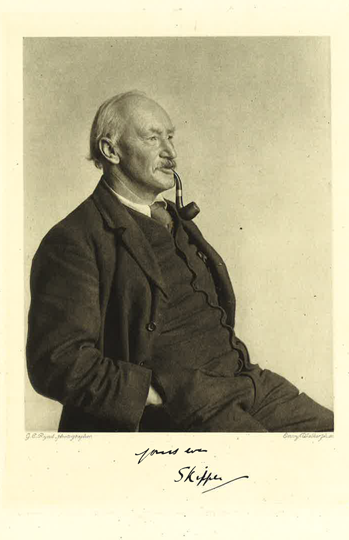 In 1896 he got a First Westminster Studentship at Christ Church Oxford, where he became a don and Senior Censor. In 1914 he became an Orderly & Interpreter with Motor Ambulance No. 4 (BEF), before transferring to the RNVR, where he obtained the rank of Lieutenant. Edmund Deane (Private, Canadian Infantry). The son of Rev & Mrs Deane of Willoughby, Rugby. After leaving St. Edward’s School Oxford, he emigrated to Canada to farm. Killed near Ypres, aged 38. Killed by random shellfire in Ypres, aged 23. The younger son of the late Rev AE Clarke & Mrs Clarke of Camberley. Won the 3rd Scholarship to Winchester College and a Scholarship to New College Oxford. Taught at the Royal Naval College, Osborne before the War. Killed in the attack on the first day of the Battle of the Somme, aged 33. Only son of Lt. Col & Mrs A Ruttledge of Castleconnell, Co. Limerick. From Clifton College he entered Sandhurst. He won the MC at Neuve Chapelle in 1914 and was twice mentioned in despatches. Killed by a shell in the attack on the first day of the Battle of the Somme, aged 21. Son of Dr & Mrs Counsell of 37 Broad St., Oxford. Won a Scholarship to Lancing College before going up to Trinity College Oxford, where he got a first class degree in Law. In 1914 he joined up as a Private in a Public School Battalion. He then gained a commission in the Hampshire Regiment. Died of his wounds in the Battle of the Somme, aged 26. Fifth son of Rev & Mrs TW Gibson of Cranham Rectory, Upminster. Won top scholarship to Winchester and then New College, Oxford. Joined the Artists’ Rifles as a private (1914); became a 2nd Lieut. with South Staffs before being transferred in 1915 to the Bedfordshire Regiment. Mentioned in Despatches (1916). Killed in an attack on Trones Wood (Battle of the Somme), aged 21. Son of the Rev. & Mrs GG Brown of St. Mary’s Rectory, Bedford. Awarded the 3rd Scholarship to Marlborough College. He was reading for Greats at Balliol College Oxford when war broke out. Killed in an attack in the Battle of the Somme, aged 23. Eldest son of Mr & Mrs Claude Burton of Berkhamsted, Herts. Won top scholarship to Repton and an exhibition to Wadham College, Oxford. Killed in the capture of Longueval & Delville Wood (Battle of the Somme), aged 23. Died of scarlet fever in St. Omer Hospital, aged 35. Son of the late Mr FR and Mrs Benham of Dean’s Hill, Stafford. Went to Marlborough College and then joined the Army by way of Woolwich. In 1914 went out to France with BEF and fought through the Mons retreat and at Le Cateau. Died of wounds suffered in the Battle of the Somme in Queen Alexandra’s Hospital in London, aged 30. Youngest son of Rev & Mrs Charles Blencowe of Marston St. Lawrence, Banbury. After attending St Edward’s School, Oxford, he became a schoolmaster at a Preparatory School. He joined the Public Schools Battalion of the Royal Fusiliers on the outbreak of war, serving as a sergeant, before gaining a commission with the Ox & Bucks Light Infantry. Killed by a shell at Guedecourt on the Somme, aged 26. The only son of Rev & Mrs T.D. Raikes of Whichford Rectory in Warwickshire. Won a scholarship to Radley College and a Mathematical Exhibition to Corpus Christi, Oxford. Joined the 1st Batttalion UPS Royal Fusiliers as a Private before gaining a commission with the Essex Regiment. Killed by a shell near Flers in the Somme battle, aged 20. Eldest son of Mr & Mrs James Hardman of Grove View, Delph, near Oldham. Attended Malvern College and then received his commission in March 1915. Killed in action near Kut, aged 19. Second son of Lieut.-Col. & Mrs CJ West of Hermitage, Newbury, Berks. From Marlborough he went to United Services College Windsor and then Sandhurst. Awarded the MC for ‘conspicuous gallantry’ in May 1915 and was Mentioned in Despatches in July 1916. Killed by shellfire at Courcellette, aged 22. Son of Mr & Mrs Edouard Clunet of Place Boieldieu, Paris. Attended Lycée Louis-le-Grand and then the Université de Paris. In 1914 he became a military surgeon with the French Army on the Marne, winning the Croix de Guerre, and at Gallipoli. Died on active service of typhus fever in Romania, aged 39. Younger son of Mr & Mrs Charles Pratt of Marley House, Haslemere. From Blundell’s School he gained a commission aged 17 with the 10th Battalion of the Yorkshire Regiment. Killed by a sniper near Arras, aged 19. Son of Rev & Mrs WF Thompson of Fyfield, Oxon. From St. Edward’s Oxford, he went on to study Chemistry at St. John’s College, Oxford. In 1914 he joined the 8th Royal Berks, before transferring to the 8th Shrops. LI in 1915. Killed by machine-gun fire at Monchy-le-Preux during the battle of Arras, aged 25. Son of the late Professor & Mrs Herbertson. Winner of an Exhibition to Magdalen College School, he was at Balliol College, Oxford when war broke out. Killed on night patrol during the battle at Arras, aged 22. Only son of Rev & Mrs WHP Arden of Whiteparish, Salisbury. Won a scholarship to Radley College followed by an Exhibition to Queen’s College Cambridge. He was due to train for Holy Orders when war broke out and he joined the RGA. Served in France on the Somme. Died of his wounds at Messines, aged 25. Son of the late Bishop of Norwich & Mrs Sheepshanks of 15 Bracondale, Norwich. Scholarship to Winchester College and Scholar of New College Oxford. Worked in the Home Office before joining the KRRC in 1914. Died of wounds from shell-fire, aged 26. The eldest son of Mr Edward Jenks (Principal of the Law Society) & the late Mrs Jenks. From Blundell’s School he went to London University, gaining a First-Class degree in Engineering. In 1914 he joined the Duke of Cornwall’s Light Infantry, winning the MC in 1915. Transferred to Royal Engineers, and was given command of the 152nd Field Company. Killed by a sniper near Kemmel Hill on the opening day of the battle at Ypres, aged 26. The elder son of the late Mr & Mrs WF Wells-Cole Cole of Dunstal, Lincs. From Repton College he passed into Sandhurst and in 1916 got a commission in the Lincs Regiment. Killed in an attack nr. Wytschaete on the first day of the battle at Ypres. The youngest son of the Rev & Mrs WH Cam of Paulers Pury Rectory, Towcester. Won a scholarship to Dover College and then studied Electrical Engineering at the Central Technical College. Enlisted in the Engineering Company organized by Mr Winston Churchill to be attached to the Royal Naval Division. He served in the Gallipoli campaign before being invalided home. In December 1916 he was given a commission in the Royal Engineers. Killed by machine-gun fire on the Ypres-Menin Road, aged 22. The second son of the late HB Falkiner Esq and Mrs Falkiner of Terenure Road, Dublin. He won a scholarship to Blundell’s School and entered Sandhurst in February 1916 with a prize cadetship. Killed leading an attack at Fregenberg, near Ypres, aged 19. The third son of Mr & Mrs GD Jefferson of 35, Bryanston Street, London. Joined St Bees School, which he left aged 16 in 1914 to join the firm of Lionel Woodhouse & Co in Marsala, Sicily. He returned the following year to join up, receiving his commission in September 1915. Killed in an attack at Langemarck, aged 19. Only son of Mrs Scott of the late Mr GR Scott, Fellow and Tutor of Merton College, Oxford. From Rugby School he went to McGill University in Montreal to study Civil Engineering. Returning in 1915, he joined the Ox & Bucks Light Infantry. He was twice wounded in 1916. Killed in an attack near St Julien in the battle at Ypres, aged 25. Only son of Sir William (Regius Professor of Medicine) & Lady Osler of 13 Norham Gardens, Oxford. He went on to Winchester and entered Christ Church Oxford, when the war began and he joined up. Died of his wounds on Pilkem Ridge, aged 21. Only son of Mr & Mrs Pratt of Poolfield Avenue, Newcastle, Staffs (and late of St. Margaret’s Rd, Oxford). Went on to Wellingborough College and then joined the National Bank of South Africa. Joined the Van de Venter’s Scouts before being drafted in to the Military Labour Bureau. Died of spotted fever at Iringa, aged 25. The older son of Mr Arthur Sidgwick, Fellow and Tutor of Corpus Christi College, and Mrs Sidgwick of 64 Woodstock Road, Oxford. Won the top scholarship to Winchester College and was elected Scholar of Balliol College Oxford. In 1906 he joined the Education Office, leaving them to join the RGA in 1916. Killed by shellfire near Ypres, aged 34. Second son of the late Captain GRV Hume-Gore and Mrs Hume-Gore of Derryensken, Ireland (late of Bardwell Road, Oxford). Straight from Marlborough College he joined the Argyll & Sutherland Highlanders before being attached to the King’s African Rifles at the end of 1916. Killed in action at the Battle of Nakadi River, aged 20. Only child of Dr & Mrs WJ Turrell of Cherwell Lodge, Oxford. From Sherborne School he went up to Queen’s College Oxford in 1915. Died of wounds suffered near Ypres on 22/8/17 in St Thomas’ Hospital London, aged 19. Second son of Rev & Mrs JF Kendall of the Vicarage, Richmond, Surrey. From Marlborough College he went to Caius College Cambridge. Joined the Norfolks in 1914 and fought at the Battle of Loos. Appointed to the MGC (Cavalry) in 1916. The fourth and youngest son of the late Rev Canon & Mrs FW Spurling of Keble College and Chester. From Rossall School he went out to South Africa and became an ostrich farmer. Returned to England in 1915 and joined the Rifle Brigade. He was seriously wounded twice, at Ypres and Havrincourt Wood. Died of his wounds, near Poperinghe, aged 32. Younger son of Lieut.-Col Collier (RAMNC) and Mrs Collier of St. Mary’s Entry, Oxford. Entered RNC Dartmouth by way of RNC Osborne. Served on HMS Implacable, HMS Defence and HMS Britannia before moving to submarines. Lost at sea, aged 25. Only son of Dr & Mrs Emmett of Winton, North End, Portsmouth. Leaving Repton School in 1917, he joined the RNAS and trained as a pilot. Killed in a flying accident near Dunkirk, aged 19. The only son of the late Rev & Mrs Addis of 5 Lebanon Park, Twickenham. From Westminster School he joined the Royal Dublin Fusiliers in 1915. He was wounded in the Dublin riots in May 1916. Killed in the Spring Offensive at Sandbag Alley, Lempire, aged 20. The third son of the late Mr Herbert Fisher & Mrs Fisher. He was the brother of the late Charles Fisher, Rt. Hon. HAL Fisher & Capt. WW Fisher. After attending Haileybury College he became an architect. Earlier in the war he worked as a medical orderly, before joining the RFA. He crossed over to France in June 1917 and took part in the battles at Ypres & Cambrai. Died of illness contracted at the Front, aged 46. The younger son of the late Canon Haig-Brown (Headmaster of Charterhouse School) and Mrs Haig-Brown of 19 Tite Street, Chelsea. Won the 8th scholarship to Charterhouse and went on to Pembroke College, Cambridge. Played football for Cambridge and Tottenham Hotspur and was the author of several books. Commanded the Lancing College OTC. Assisted with the training of 12 battalions of the New Army before joining his regiment. Twice wounded. Awarded the DSO in 1917. Killed in action at Bienvilliers, aged 40. Younger son of Major-General HF Thuillier CB CMG and Mrs Thuillier of Gerrards Cross, Bucks. From Dover College he went to Sandhurst, gaining his commission in June 1916. He took part in the Somme battle and in January 1918 won the MC. Killed in action at St. Christ on the Somme, aged 21. Younger son of Sir Edmund & Lady Stonehouse of Wakefield. From OPS he went to Sedbergh School. Took a commission in the ASC before joining the RFC, training in aerial gunnery and as an observer. Killed by an aerial bomb, aged 28. Third son of the late Mr Salmon-Backhouse of Leeds & Mrs Backhouse of 8 Clifton Road, London. On leaving King’s College School, Wimbledon, he was apprenticed to an Inventor’s Engineer in London. Returned from the Argentine at the outbreak of was to serve as a Private in the Royal Fusiliers. Gaining a commission in the East Lancashire Regiment, he then joined the Army Cyclist Corps and went to Salonika. In 1917 he joined the RFC. Killed in an aerial action in Salonika, aged 29. Eldest son of Rev & Mrs Llewelyn Thomas of Newland Vicarage, Hull. Won an Open Scholarship to Rossall School and then trained at Quetta (India) in 1915, passing out first with the Sword of Honour. Served in India and Palestine. Killed by machine-gun fire at El Kefr, near Ramleh, aged 21. Son of Mr & Mrs GJ Burch of 28 Norham Rd., Oxford. He won the top scholarship to Felsted School and subsequently in 1911 won a Science Scholarship at Emmanuel College, Cambridge. He was shot down near Hazebrouck, aged 26. The third son of the late Mr CE Bickmore of New College & Mrs Bickmore. Passed into RNC Osborne in 1905, and went on to Dartmouth in 1907, becoming a Midshipman in 1909. Having been with HMS Monarch at the start of the war, in 1915 he was transferred to HMS Comet, in the Eastern Mediterranean Fleet. Elder son of Mr & Mrs Holt of 6 Sussex Square, London. From Harrow he passed into Sandhurst, receiving his commission in the OBLI in July 1916. Transferred to the Tanks Corps in 1917. Killed In the advance near Albert, aged 20. Elder son of Dr & Mrs Buck of Harrow on the Hill. At Winchester he excelled in all sports. He joined the London Regiment straight from school, aged 17. He entered the trenches in 1915 but transferred to the RFC in 1916 and flew Handley-Page bombers. He was awarded the MC (1917) and DFC (1918). Died in a crash returning from a mission, aged 21. 3rd son of the late Mr Henry Twigg & Mrs Twigg of Weeping Cross, Stafford. After attending Repton he entered Siemens’s Dynamo Works, Stafford as an electrical engineer. Thereafter he worked at Messrs. EG Wrightley & Co’s Engineering Works at Smethwick. In 1914 he joined the Royal Warks. before transferring to the 3rd Northants. Killed whilst leading his company in an attack near Bellicourt, aged 34. Eldest son of the late TF Ricketts MD FRCS & Mrs Ricketts of 18, Grand Parade, St. Leonard’s on Sea. Attended Oundle School. Recovering from illness, he joined the RFA and went to France in June 1918. Wounded on August 29th by shellfire. Died of his wounds in Rouen, aged 24. Kenneth Rudd (Capt., West Yorks). Only son of the late Prebendary Rudd of Souldern Rectory, Banbury & Mrs Rudd of Whitehall, Goodrich, Herefordshire. Won a scholarship to Shrewsbury and then to Jesus College, Cambridge. Enlisted with the Shrops Light Infantry at the outbreak of war before transferring to the West Yorks. Wounded 1916. Hit by splinters from a shell and died of his wounds near Inchy, aged 24. Stuart Taylor (Brigadier-Gen., West Yorks R). Eldest surviving son of the late James Taylor, Bus. Doc., of Threlfell and New College, Oxford and of Mrs Campbell Taylor of Rotherdale, Mayfield, Sussex. Won a scholarship to Bedford Grammar School and then entered the Army with the King’s Own Yorkshire Light Infantry, serving in the Tirah Expeditionary Force (1897-98), receiving the medal with two clasps. Also served throughout th South African War, gaining both medals, with six clasps, was twice mentioned in dispatches. He was present at the battles of Belmont, Graspan, Modder River and Magersfontein. Served as Political Officer, Northern Nigeria (1907) before retiring from the Army in 1910. He was re-employed at the start of the War, transferring to command the 15th West Yorkshire Regiment (Leeds) in May 1915. Wounded in May 1916, was three times mentioned in dispatches and was awarded the DSO in July 1917. In April 1918 he was promoted to command the 93rd Brigade. Died of wounds received on October 1st, aged 45. 4th son of the late Mr Christopher and the late Mrs Ling of Birkdale, Lancs. Attended Bradfield College and left to join the Army in 1912. Died of from illness contracted on active service, aged 35. Elder son of Mr & Mrs Horace Robinson, William was born and bred in South Coorg, Southern India. Having completed a year at the OPS he went back to India before returning to St. Bees School in Cumberland. He entered Sandhurst in August 1914 and was gazetted to the Worcestershire Regiment. He joined the RFC in 1915 as an observer and then trained to be a pilot. He was the first to bring down an airship over England, in 1916, for which he was awarded the VC. He was shot down over enemy territory in April 1917 and was a prisoner of war until the end. Returning in a highly weakened state, he succumbed to influenza, aged 23. The younger son of Sir Nathaniel & Lady Highmore of Harbybrowe, Worcester Park, Surrey. After attending Charterhouse he trained as a solicitor. At the outbreak of war he joined the Artists’ OTC before getting a commission with the MGC in 1916. Severely wounded in June 1917, he was invalided out in April 1918. Died of acute pneumonia in Dorchester, aged 32. Youngest son of Sir Ernest Trevelyan of 1 Marston Ferry Rd., Oxford, he joined the RN by way of Osborne & Dartmouth. Served on HMS Malaya at Jutland and in the Dover Patrol on HMS P50. Died of bronchial pneumonia as result of his naval service, aged 19. Son of the late Dr J Bywater-Ward & Mrs Bywater-Ward of 40 St Giles, Oxford. He joined the RN by way of HMS Britannia. Served on HMS Ajax at the Battle of Jutland. Ill health forced his retirement in July 1918. Died of pulmonary tuberculosis which developed in the course of performing his duties, aged 37. The only son of the late Mr Gay and Mrs Gay of Oxford (and Aldborough Hall, Norfolk). From Winchester College he went to New College Oxford. A tea planter in Ceylon (1903-8) before returning to farm in Norfolk. Went missing along with 250 1/5th Norfolks in an attack on Teke Tepe (Gallipoli campaign). Elder son of Mr & Mrs HM Dowson of Holiday House, 12 Chadlington Road, Oxford. On leaving Rugby School, he went straight into the army on the outbreak of war. He was three times wounded before returning to the front in January 1917. Went missing in a night-time retreat during the battle at Arras.